The cost to purchase state-of-the-art equipment for a machine shop in Massachusetts, combined with the investment required to hire or train employees to operate them with precision, makes it prohibitive for many businesses to do CNC machining services in-house. As a result, finding a quality and reputable precision machine shop in the local area has become an essential part of doing business. Outsourcing this work to a professional CNC machine shop can help to save both time and money by reducing development time, improving the quality of parts and products, and increasing productivity across the board. Massachusetts precision machining specialists can produce complex parts for just about any type of application across many different industries, providing extremely high levels of accuracy. Short and high volume runs are possible today that would have been much more complicated and costly years ago. 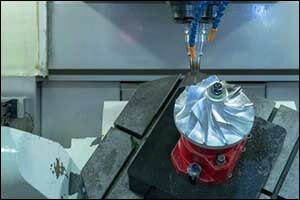 Computer Numerical Control (CNC) machines play a big part in the advancements made by precision machining specialists, giving them the equipment necessary to convert 3D designs into physical products. As the name suggests, precision machining provides accurate results, creating parts that are identical in quality, whether the shop creates one or a thousand to complete the order. While there are many different industries that rely on Massachusetts precision machining services for manufacturing, there are certain types of businesses that benefit from CNC machining services the most. Due to the high demands of these growing and expanding industries, our professional CNC machine shop and precision machining specialists have had to step up our game through training and advanced equipment to meet the demand. At AMI Machining, our one-stop precision machine shop in Massachusetts utilizes numerous high-value, state-of-the-art equipment, including CHC machining, for both long and short run part milling. Our team relies on our CNC turning lathe centers as well, which are designed to support large diameter turning at close tolerances. Our mission is to provide each client with on-time service and quality products by embracing the industry’s best practices and using the latest, most advanced equipment and techniques. AEROSPACE – CNC machining services are instrumental in the development of critical parts for the aerospace industry. Our team of precision machining specialists at AMI Machining uses our extensive resources, which include tooling and gauging for our high-performance turning machines in our professional CNC machine shop to run at maximum productivity while maintaining unmatched quality and tight tolerances. MILITARY/DEFENSE – Many of the applications used in the military/defense industry can be outsourced through an ITAR registered machine shop in Massachusetts like AMI Machining. Quality, consistency, reliable delivery, and adherence to industry standards are just some of the requirements of working for an industry that is bound by government safety codes. Our precision machining specialists must meet tight tolerances and equipment needs to be monitored for wear and quality assurance throughout manufacturing to ensure the consistency of vital components. ELECTRONICS – Our precision machine shop works with a lot of clients who develop and produce consumer electronics and professional-grade electronic devices. By taking part in early design involvement, our team can help customers to reduce manufacturing costs and provide continuous process improvement. Our custom manufacturing solutions can be used for CNC machining services small scale and micromachining to create specialized materials at very tight tolerances for low or high volume runs. MEDICAL/BIOMEDICAL – Our Massachusetts precision machining specialists are frequently contracted out to build the components that are used in vital medical devices and equipment. These components require extreme precision, which can be achieved through our professional CNC machine shop. Accuracy, consistency, and repeatability are required to meet the high demands of this industry. Medical instruments, surgical implants, and a wide range of specialized orders must all come with the FDA process and tracking reports necessary to meet regulations. CONSUMER GOODS – Our machine shop in Massachusetts can manufacture a wide range of commercial products to provide clients with consistent quality and repeatability while ensuring the best possible pricing. Limitless sizes, shapes, and materials can be used to meet the needs of our clients. 3D graphics, CAD prototyping, and modeling in design development can help to reduce costs for manufacturing and improve lead times for product launch in a competitive market. Our precision machine shop is located in Middleboro, Massachusetts; however, we provide our services to clients from all across the country. Our one-stop machining, assembly, and CNC machining services are very attractive to many customers, producing consistent results in our state-of-the-art climate controlled facility. Our precision machining specialists are highly trained, skilled, and experienced, to ensure custom manufacturing solutions for every client we serve. We are ITA registered, veteran owned, and ISO 9001 certified to provide our clients with the best possible options and services available. If you are interested in learning more about AMI Machining or would like to speak with an engineer about placing an order with our machine shop in Massachusetts, give us a call at 508-947-1192.